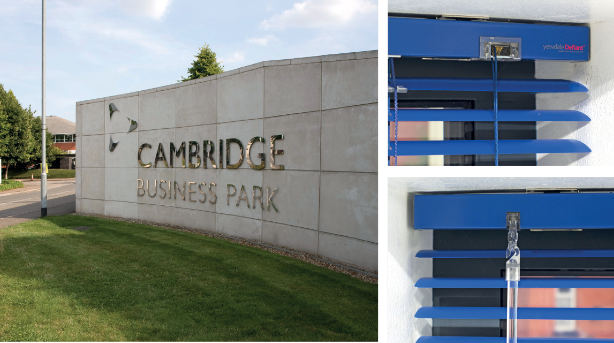 Cambridge Business Park is a premier business park home to over 17 tenants, including the BBC, Autonomy and Qualcomm. The site has a focus on providing flexible and diverse accommodation for businesses, built to make it as easy as possible for business to thrive. Stylistically, these buildings are modern and corporate. The shading systems installed within need to suit the atmosphere, to help create a space conducive to flourishing businesses. A popular type of blind in these environments are venetian blinds with their contemporary-yetfunctional benefits. Fortunately for Yewdale, the venetian blinds passed the test and Paul ordered 21 YewdaleDefiant® VN25 venetian blinds in a Silver Shine finish. The installation was quick and easy and Paul was left satisfied with the service he received from Yewdale.